Glendale Community College’s vocal jazz ensemble—featuring up to 16 vocalists, a rhythm section, and student sound engineers—has long faced obstacles using wired microphones. During practices and performances, on campus and on the road, the wired mics created unnecessary complications. Bryon Delto, associate professor of music at Glendale Community College, wanted the freedom of wireless without any complexities. With advice from systems and services company Hollywood Sound Systems, a proud Shure dealer for more than 50 years, Delto found the answer with Shure’s ULX-D Digital Wireless System. Hollywood Sound Systems designed a Shure ULX-D Digital Wireless System rack for Glendale Community College’s vocal jazz ensemble. Brett Grossman, project manager at Hollywood Sound Systems, recommended the audio system. Eliminating tangled wires and streamlining audio management, Delto’s adoption of Hollywood Sound Systems’ carefully designed Shure ULX-D rack has brought the ensemble’s performances to new heights. The school’s set-up involves four ULXD4Q Quad Channel Digital Wireless Receivers combined with 16 BETA 58A handhelds. 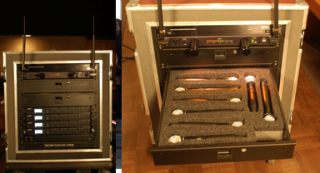 Each of the 16 channels is operated from two single rack units, providing important space savings for Delto and the ensemble, as the gear provides the mobility to move freely from rehearsal rooms to the performance stage. "With Shure ULX-D Digital Wireless, the switch to a wireless platform was easy. In a school environment where student sound engineers are in charge, the system must be intuitive with a short learning curve. Students have quickly picked up ULX-D, and the sound we get out of it is incredible. Additionally, it’s extremely convenient to have everything centralized in a small rack space that rolls right into our confined storage space," Delto commented. The Glendale Community College jazz ensemble has also benefited from ULX-D’s rechargeable batteries, which eliminate the need for disposables. With the rechargeables, student sound engineers can monitor run time and metering accuracy in hours and minutes. Another highlight of the system is its Dante digital audio integration, offering multichannel audio networking over a single Ethernet connection and computer-based playback, recording, and signal routing. Glendale Community College has a college-credit enrollment of about 25,000 day and evening students, and approximately 10,000 additional students in the adult education program and specialized job training programs.